The new school building at that time was so much nicer than anything we had been used to that we were as thrilled as the boys and girls are here today. 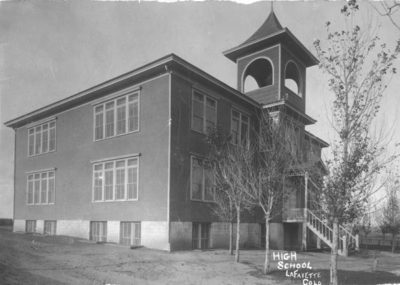 The old building that had stood where the present grade school, Baseline, now stands had been condemned. It had been built in the 1890’s. (I have been told the date was 1896). It was constructed of brick that had been made in the old brick kiln that was just east of the end of Cannon Street. The bricks were of poor quality, they weathered and crumbled after about ten years. There were two rooms on the back of the building that had been built at a later date. The rooms were poorly lighted. (Remember electric lights were something very new even in 1900). They cold not be used in the daytime because the light plant only operated during the dark hours of the morning, lights came on at 5 a.m. and off at sunrise — then on again at dark and off at 9 p.m. The walls had become dingy and the plaster was coming off in many places. The coal stoves in each room smoked when the wind blew and many times we were excused from school because the building shook so badly when the wind was strong. Then came the time when it was decided that a new school was needed. I do not remember just how we got through the year prior to the building of the new school , but I do remember that school was held in the churches, in some rooms in the old Bermont Building, now Roberts’ Grocery, and one or two classes were held on the hill in an old saloon. In fact, school was held all over town. Then came the announcement that school would not start the day after Labor Day as in the past, the new building would not be ready until October. In October we all went to school, I notice today the children are being brought from every place by bus and car, very few are walking. The first day of school in 1904 was very much different. The Schofields, Kneebones and Browns walked in from the north, the Wanekas, Barrowmans and Johnsons came from the east, the Millers and Harmons from the south, the Thomases and Petersons from the west. Very seldom were any of the country children brought in as it was just about as fast and much simpler to walk than to hitch up the horses. Many of the country boys and girls maintained perfect attendance records for several years. Nothing kept us from school because we were always cautioned that playing hooky or getting a whipping in school meant another whipping at home and if you ever had a whipping with a rawhide buggy whip you were very careful not to do anything to warrant another one. The new school building was beautiful with the wainscoating varnished and the new artistic tin wall painted a light blue or green. The octagon-faced clocks in each room were really something as we had never seen such time pieces. The school bell would start to ring at 8:30 and would ring for five minutes, this was to let everyone know that they should start for school. Then at five minutes till nine the last bell rang for three minutes and the tardy bell at nine. We always had a contest and if no one had been tardy for a whole month we got to do something special. Like having the good readers in the class read an extra chapter, one of the Alger books or Motor Boys. We sometimes got out fifteen minutes early as a reward. Tardiness was one of the worst things we could do. It was better to be absent than tardy. There was no water in the school and the hydrant outside had two or three cups fastened on chains, we all drank from the same cups. The water was good only during the winter months and it came from two small ponds at the west end of town. At recess time, noon, and after school we all would dash down to the O’Day well in the back of the house, now 311 East Geneseo St. The water was brought up in a wooden bucket and we either drank directly from the bucket or from cups some carried and tin cans. The water was cold and tasted very good. There was a high board fence around the school ground with a picket fence across the front. The country kids brought their lunches and it had to be a pretty bad day before the janitor allowed us to eat in the basement, which was not finished. We hunted the warmest places around the building or next to the fence. There were two outside toilets, six or eight holers. The boys’ toilet was on the northwest corner and the girls’ on the northeast corner. We had an hour and half at noon, the first bell rang at 1 p.m. and the last bell at 1:25. So we had lots of time to play, fox and geese when the snow was on the ground and it was too cold for snowballs. When it warmed up we had snowball fights. When the ground was clear we played dare-base, pum-pum-pull-away and anything we could think of with lots of activity. In the spring, marbles, tops, and foot-and-a-half had their seasons. The girls jumped rope, played hopscotch and all kinds of sissy games. School was out at 4 p.m. In school the teachers each had a short piece of rubber hose that was used many times. I remember Mrs. Hilliard in the fourth grade using a piece of garden hose doubled-up on one of the boys and one end came loose and she broke the glass face of the clock, needless to say she lost control of the fourth grade for a little while. To get back to the building—it was covered with a tin that was pressed to represent brick, the tin was painted a brick red and the painters had to line the creases with white paint. It was a long tedious job and the men were still working when we started to school. One day while we were in class, one of the painters began to whistle and Gomer Downing let out a loud giggle. Mrs. Hilliard grabbed him by the back of the neck, put her foot upon the seat, turned him over her knee, took off one of slippers and tanned his seat. (Believe me we respected her). We did not have any kind of auditorium, class plays and graduation was held in the Union Hall. Then on April 1, 1910, tragedy struck the town, the strike of 1910 was called and it became a nightmare for students and teachers. Strike-breakers were shipped into town and school activities were at a standstill for a year or two. Neighbors did not speak, fights were frequent and things were not good. The Union Hall had become a store and there was no place to play basketball except at the old livery stable where the Eastside Apartments now stand, Class plays and graduation had to be held in the Jewel Theatre. In 1918 the back part of the school was condemned and an addition was added which is the present grade school auditorium. This was such an improvement. 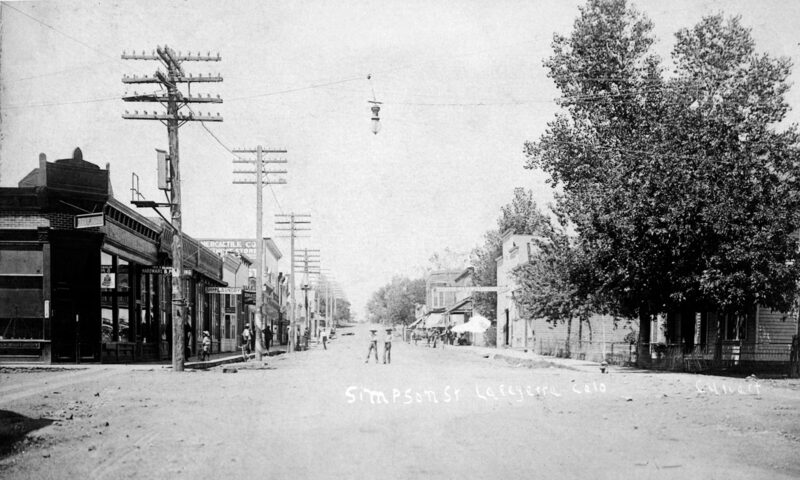 All school and town activities took place there. The bathrooms and heating system were added at this time. The old heating system had been a hand fired boiler. The old building has been condemned and repaired many times and thousands of students have passed through its doors in the past sixty years. It has seen many advances in transportation and science and I am sure the teachers who have taught there and the students who have studied there have added their part to the history.